Eureqa’s Search Relation setting provides quite a bit of flexibility to search for different types of models. This post describes some advanced techniques of using the Search Relation setting to specify custom error metrics for the search to optimize; or more specifically, arbitrary custom loss functions for the fitness calculation. 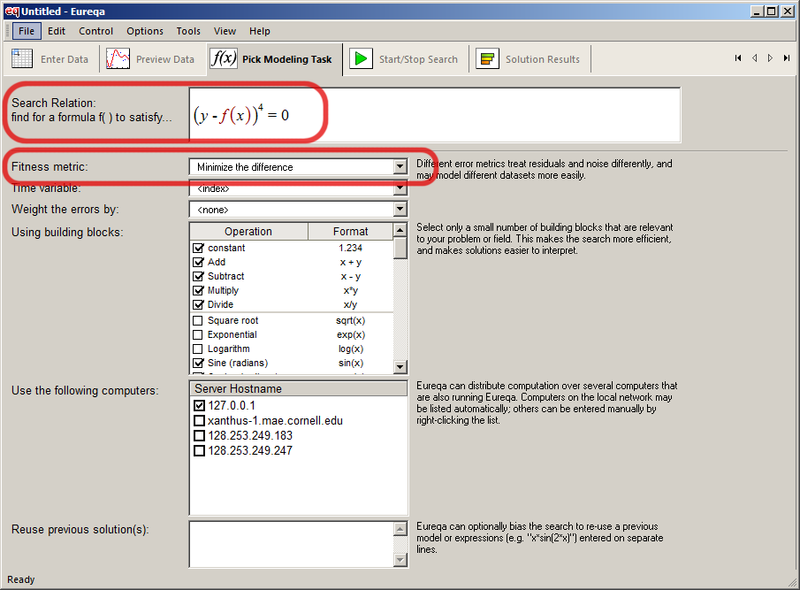 would minimize the maximum of the absolute error and squared error, at each data point in the data set. Now, both the left and right sides get squashed down to a tanh function (an s-shaped curve that ranges -1 to 1) before being compared. This effectively caps large errors, reducing their impact on the fitness. Notice the unusual 0*log(f(x)) term. Whenever f(x) is positive, the log is real-valued, and the multiplication with zero reduces the expression to y = f(x). However, whenever f(x) is negative, log(f(x)) is undefined, and produces a NaN value. Whenever a NaN appears in the fitness calculation, Eureqa automatically assigns the solution infinite error. Therefore, this search relationship tells Eureqa to find an f(x) that models y, but f(x) must be positive on each point in the data set. This behavior can be used in other ways as well. Any operation that would produce an IEEE floating point NaN, undefined, or infinity will trigger Eureqa to assign infinite error. You can also add multiple terms like this to place multiple different constraints on solutions.